Is your business declining because your employees are not motivated to do their job properly? Are they stressed, taking it out on customers and giving your company a bad reputation? Are there conflicts between co-workers, gossip and bickering? Are you losing money because your employees steal time on the clock, office supplies or inventory? All of these issues are problems we hear of everyday from business owners looking for a positive change for their company. Many think an easy solution would be to fire then re-hire someone else only to find yourself in the same vicious cycle of a high employee turnover rate and low customer retention. The reality is, it’s hard to find really great help these days. The moral values in our society have declined rapidly, and your employees simply were not taught the same values you were when you were growing up. All hope is NOT lost, however. There is a solution. The easier and most effective solution is to provide your employees proper training on how to improve their positive moral character. Your employee will learn how to value their job, co-workers, and your business. 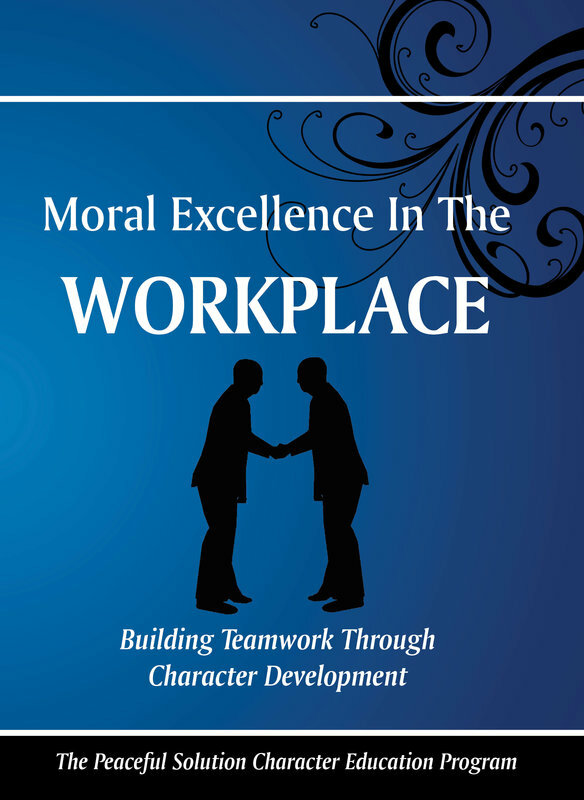 Training in moral character, as presented through the Peaceful Solution Character Education Program Moral Excellence In The Workplace, encompasses acceptable behaviors, attitudes and communication skills necessary for a productive, friendly work environment. It promotes teamwork and respect for co-workers and authorities, all the while stressing the importance of being responsible for words and actions. Your employees will improve their character in order to positively deal with stress that will motivate, increase productivity and decrease work place tensions. In order to have a successful business you need hard working employees with positive moral values. You can spend years trying to find that perfect team, losing time and money along the way, or you can create that in the team you already have using this simple but effective program.